It happens in the movies all the time, when suddenly out of no where a C list or D list actor suddenly makes the jump into a blockbuster flick somehow (like Stephen Dorff in the new Sofia Coppola flick)-well it happens in the comics too and the upcoming Wolverine: The Best There is #2 proves that! It was a while back where I profiled the ultra lame Madcap right here as one of the world’s lamest villains, a D-list character who made a few ridiculous appearances in Captain America in the 80’s using a bubble gun that drove people batty and taking on taking on Cap’s buddy Nomad several times. 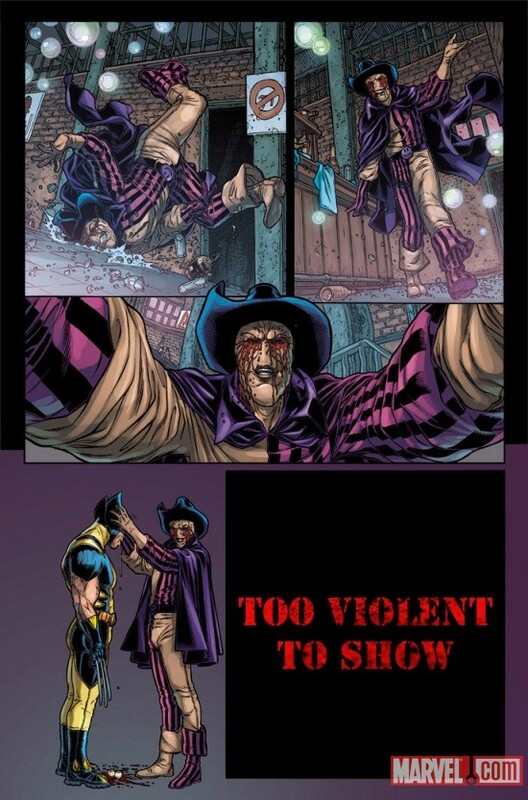 Well now good ol’ Madcap is bringing his antics back in the new ultra violent Charlie Hutson penned Wolverine series. This time however it seems that Madcap is even more fucked in the head than imagined as he’s now working for Wolverine’s newest villain Contagion and from the sneek peek it appears he’s ripped out his own eyes. Since Madcap can’t feel any pain this upcoming bout proves to be an interesting one I’m pumped to check out! Who knows too maybe this will put Madcap on the map as one of Wolvie’s A-list enemies-lord knows we’ve had enough of Sabretooth! Now maybe if we can just get The Slug out of hibernation to take on Logan ?? Their meeting I must say afetr reading issue 2 was somewhat fucked up-I hope that Madcap comes back for round two with a little more hurt put on Wolverine! I assume he’s not dead as he’s shown again on the upcoming cover of issue 3…Good issue though!! Happy New Years Eve! Just Steer Clear of Trains! !